The National Oatmeal Muffin Day is observed on December 19. It is a perfect occasion to have a couple of healthy and at the same time delicious muffins. Oatmeal muffins are good for your health because oatmeal is known to lower the cholesterol level. They also taste good. So be sure to celebrate the National Oatmeal Muffin Day with buying or cooking some oatmeal muffins. 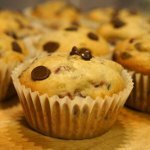 If you want to cook the muffins yourself, you can use the following recipe. First of all you need to preheat the oven to 425 °F and line muffin cups with paper liners or grease them to prevent your muffins from sticking to the cups. Combine 1 cup quick cooking oats and 1 cup milk in a small bowl. Let it soak for 15 minutes. In another bowl, beat together 1 egg and 1/4 cup oil, then add oatmeal mixture and stir. In the third bowl, sift together 1 cup all-purpose flour, 1/4 cup sugar, 2 tsp baking powder and 1/2 tsp salt. Add flower mixture to wet ingredients and stir until combined. Spoon batter into prepared muffin cups until they are about 2/3 full. Bake in preheated oven for 20 to 25 minutes. To check whether the muffins are ready, insert a toothpick into one of them. If the toothpick comes out clean, you can take the muffins out of the oven.